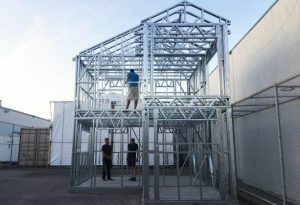 A new company is looking to shake up the traditional wood-frame industry in the Lower Mainland with steel technology and methods from New Zealand. LifeTec uses FRAMECAD, a cold-formed steel framing system that allows the studs to be completely designed digitally and then formed by a specialized machine. “We essentially build the whole house stud by stud in a virtual space,” said Krishna Jolliffe, LifeTec president. The data is then entered into a machine that converts steel into wall panel, floor joist and roof truss parts by shearing, punching and roll forming. Assembly teams then screw parts together. The team can produce about 1,500 to 2,000 square feet of wall panels a day for the average home project. The parts are packed onto pallets, delivered and then assembled onsite, which for the average home takes roughly a week. LifeTec’s frame structures have just half a millimetre of variance, unlike traditional wood frame, which moves and swells, he stated. This means with steel, workers don’t have to wait to install windows or other items.